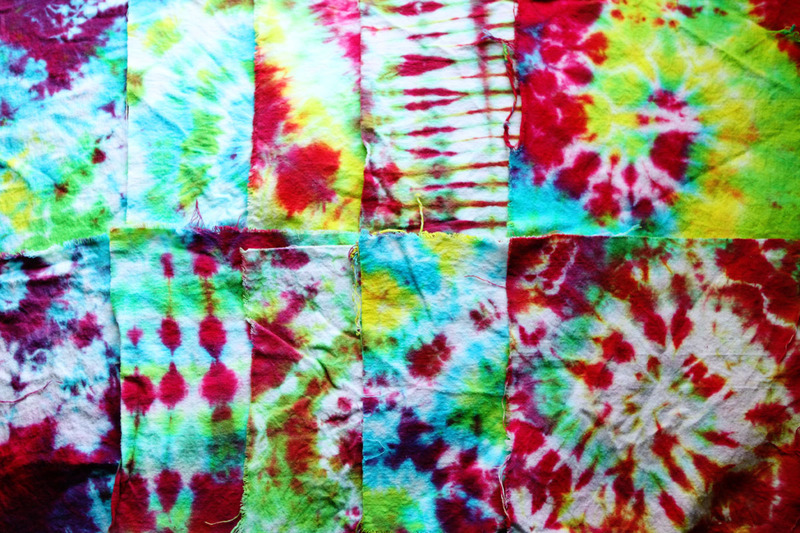 Spend some time deeply contemplating your tie dye design. Take pre-washed, damp 100% cotton fabric. Try twisting, scrunching or accordioning the fabric, or go for the classic bulls eye pattern. Fasten tight with rubber bands. Some tighter, some looser - this will vary the dye seepage. Very tight ties of course, will prevent dye access entirely, leaving undyed white areas. Put all tied fabric items into warm soda ash water solution (as provided by the handy Jaquard Tie Dye Kit, purchasable on Amazon) to soak for 20 mins. Glove up! Or you will have dyed hands. If you can't get gloves on by yourself, don't be shy: ask for help. Wear stainable clothes. 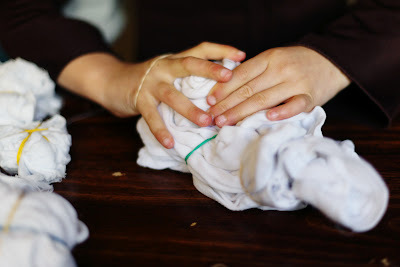 Fish out soaked fabric items, squeeze out excess liquid, and put everything on a plastic-covered work surface. The Jaquard dyes come in convenient squeezy bottles. Apply dyes to fabric, like you would generously apply ketchup to a hotdog. Place in ziplock bags for dye to bond over 12-24 hours. Remove from bags, rinse in warm water, snip rubber bands, wash with soap, and dry. And voila! I have some 30 tie dyed cotton flannel squares, ripe for quilting.